those dead shall not have died in vain. Don't let the eagle shed another tear. Do your part to keep the American spirit alive. Accept that you're not alone. The people of the United States will stand strong and united through any crisis. Buy America. Help the wounded economy make a full recovery. Celebrate today, because you're part of one of the greatest nations beneath the sun. Don't panic because of what you hear on the news or read in the paper. Embrace the ones you love and cherish family values. Fly the flag proudly. Many people have fought and died for it. Greet each dawn with optimism. Remember President Franklin Roosevelt's words: "The only thing we have to fear is fear itself..."
Honor the constitution and all the liberties it grants you. Honor the liberties it grants other Americans as well. Many have fought to give you these privileges. Instill a sense of American pride in your children. Teach them the many reasons why they should be glad to be part of this great nation. Join the ranks of those who refuse to be bullied or frightened by foreign aggressors. Do your part to help your nation and your neighbor. "I pledge allegiance to the flag of the United States of America and to the republic for which it stands: one nation UNDER GOD, indivisible, with liberty and justice for all." Love your neighbor with all of your heart. Measure the United States by all of the privileges and opportunities it grants you every day. Unlike the citizens of many other countries, you can do anything you want, become anyone you want to be. Never lose faith that this country will succeed in the face of adversity. God will always guide this nation and keep each star on the American flag shining bright. Offer hope. Everyone could use some. Pray that God will continue to richly bless this country, and remember our motto is: "In God is our trust." Quit dwelling on the negative. Instead focus on making this nation even better tomorrow than it is today in the spirit of the founding fathers. Remember those who have fought for this country and honor them. Support our troops overseas. Keep their morale up. Think about how lucky you are to be part of this great nation. Use your skills and talent to the best of your ability in order to make this country a great place to live. Vote. Don't throw away one of your greatest rights. Wear a smile instead of a frown. X-ray the heart of the nation, and you'll find that it's beating stronger than ever. The eagle has grown new wings and is taking flight. Yield to the overwhelming feeling of national pride that's all around. Zealously treasure your freedom, and do all you can to defend it with the heart of a true patriot. who have fought for me and you. most were from the "war to end all wars"
"the big one", World War Two. keeping people safe from harm. called "Hell on Wheels", a name known well. over coffee in the crowded canteen. his eyes told of his rage. I'm lucky to be alive." I will not forsake their memory." not one dry eye could be found. my patriotism, grew one hundred fold. way down deep, at your very core. and a bursting heart when "Old Glory" does fly. compound word or a single word. "Italian-American," an "Irish-American," a "Jewish-American,"
What he's sayin' is, "I'm a divided American." Yet look at the harm a line has done. That locks men's hearts from freedom's call. Who died for freedom's preservation. It can be a bridge or be a wall. A wall you always have to climb. The road to liberty lies true. The Hyphen's use is up to you. All the differences of Man. Should be our most important goal. You'll make your life mean... and small. Whose people came to her in need. Stand taller than they stood before. And that little line won't cause division. For in this land, each man's your brother. 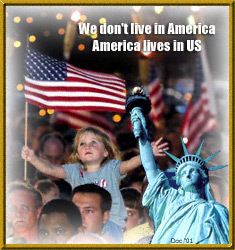 We're AMERICANS, and that says it all. on all Americans, we are all the same color." Help our Troops to quickly locate inspirational sites during their brief opportunities to browse the web. If you have a Military website or personal page that should be listed here, please send the URL to Mom.